Is the Roman Catholic Church trying to establish a strategic foothold 90 miles from American soil? And if so, why? In December, U.S. President Barack Obama surprised the world by announcing that America would restore diplomatic ties with Cuba after 53 years of hostility. The terms of the deal completely favor Cuba. Cuba did not have to abandon communism or reform its dictatorial governance. The U.S. got nothing out of this deal. What is this all about? We could write quite a bit about the president bypassing Congress and using yet another executive action to make this deal. We could say a lot about the dangers of America appeasing yet another regime that hates it. But the factor that is more significant than any of these issues is this: The deal was largely the handiwork of theVatican. Pope Francis played a vital role in the president’s decision. “Pope Francis issued a personal appeal to me, and to Cuba’s President Raúl Castro,” President Obama said as part of his landmark announcement about it. In early summer of 2014, the pope appealed to both leaders by letter, urging them to exchange prisoners and improve relations. The Vatican later hosted a clandestine meeting between the two sides in Rome. However, it was actually Francis’s predecessor who put the plan into motion. In 2012, Pope Benedict xvi began pressuring the United States to normalize relations with Cuba. Francis carried on Benedict’s efforts. After months of working behind the scenes, the momentous deal was sealed. Its announcement surprised the world. So America has opened itself up to an unsavory regime just a short boat ride away. But this is about much, much more than that, especially when you understand the history of the Catholic Church and Cuba. The Catholic Church’s history with Cuba dates back hundreds of years. In 1492, Christopher Columbus was the one who claimed the Caribbean islands, including Cuba, for Spain, the champion of Catholicism. Spain was ruled by Ferdinand ii, the king who expelled or forcefully converted Jews and Muslims and who established the Spanish Inquisition—which is why you find almost no Protestants in Spain today! Just one year later, Pope Alexander vi commanded Spain to conquer, colonize and catholicize the “pagans” of Cuba and the rest of the New World. Meanwhile, Europe’s Habsburg dynasty was becoming very powerful. Through marriage and inheritance, the Habsburg Empire extended into Spain in 1516. Soon, Spain was integrated into the empire. In the early 1500s, Charles v gained power over the Netherlands, Spain and Germany. In Rome in 1530, the pope crowned him emperor. He headed the fourth resurrection of the Holy Roman Empire. Charles continued to work closely with the popes, and the Roman church steered his empire. By the end of the 1500s, Spain had become the richest country in the world. Much of this wealth and power came from Spain’s conquest of the New World. Fleets of ships laden with billions of dollars in gold and silver crossed the Atlantic. And Cuba played a vital role in its wealth. Havana, Cuba, was the primary port for shipping all the treasure Spain was confiscating and mining in the New World. Ships ferried tens of thousands of tons of silver and gold from North and South America to Havana and from Havana to Seville, Spain. There, the Spanish spent it on the Habsburg’s struggle against the Ottoman Empire and its war with the major European powers of the day. It also helped to finance the Catholic Church’s inquisitions as that church tried to extinguish all other religions in Europe. For many years, not a single European power was strong enough to stop the mighty and wealthy Holy Roman Empire and its ambition to colonize and catholicize the New World. This is part of Cuba’s heritage. Modern Cuba is a Communist nation, but it has only been Communist for about 50 years—less than a lifetime. It has been a Catholic country for almost 500 years! Today, between 60 and 65 percent of Cubans say they are Catholic, so it’s clear that the church’s influence remains deeply entrenched. Fidel Castro is close to death. And Raúl Castro is quite old. So the political equation could change radically in the next few years—or even months. If enormous changes occur, the Vatican could gain real power in Cuba. Many do not think the Caribbean is strategically important, but that’s because the United States has dominated it for many decades. For the Catholic Spanish Empire, Cuba was the single strategic port that served two entire continents. For Napoleon, Haiti served as the basis of his empire in the New World. When he lost Haiti in a slave revolt, he gave up his ambition in the Western Hemisphere and sold off a massive chunk of territory in the Louisiana Purchase. But there is a much more recent reminder of Cuba’s strategic importance. If you are older, you probably remember late 1962, when the U.S. discovered that the Soviet Union was deploying missiles to Cuba. Sources told the Americans that some of the missiles were so big that the tractor trailers carrying them through Cuban towns had trouble making turns. The Soviets were fortifying Cuba with ballistic missiles equipped to carry nuclear warheads. And they were about to aim these deadly missiles at the American mainland from point-blank range. Most authorities believe this was the closest the Cold War ever came to full-scale nuclear war. The Soviets wanted to deploy and activate their missiles in Cuba without America finding out. With supersonic nuclear missiles only minutes away from America’s cities, the Soviets could evade America’s missile warning system and launch a surprise attack. I believe there is ample evidence that the Soviet leader Nikita Khrushchev would have attempted to destroy America at that time. What if Khrushchev had achieved his secret plan to surprise America? He would probably never have had a better opportunity to conquer America—and he knew it! After all, he did say that the Soviets would “bury” us. At the very least, the Soviet Union would have had the U.S. at nuclear gunpoint. America’s foreign policy would have been neutralized. However, something happened in Cuba. The Americans began hearing reports that missiles were coming in. But they needed confirmation. It was difficult to fly over Cuba, a hostile nation, without getting shot down. But somehow, the Soviet plan got out of phase. The missiles arrived and were out in the open before the antiaircraft batteries were fully operational. American spy planes spotted the missiles and brought home photographic proof of Cuba’s nuclear buildup. The Cuban Missile Crisis turned out to be a victory for America, a victory that could have easily been a crushing defeat. But it proved how strategic the Cuban islands are for anyone who wants to harm the U.S. With modern weapons, how easily and quickly an enemy force can strike America’s military and its cities. Who Does the U.S.-Cuba Thaw Benefit? Where does the Vatican factor into all of this? One thing this Cuba deal has accomplished is that it has displayed to the world the kind of power Pope Francis has. “Francis is a master of blending the spiritual with the political,” wrote National Public Radio’s Rome-based senior Europe correspondent, Sylvia Poggioli. “[He] has embraced the bully pulpit of the papacy, emerging as a daring, independent broker on the global stage” (Dec. 25, 2014). What kinds of deals is Francis brokering? Who do they benefit? The Vatican claims that the U.S.-Cuba deal is “in the interest of the citizens of both countries.” Is that true? First, look at whether it was good for the people of Cuba. Critics of American foreign policy in general and of the U.S. embargo of Cuba tend to romanticize Cuba’s ruling regime. That is a serious error! Under the Castros, the people of Cuba have suffered political terror and human rights abuses. Fidel and Raúl Castro have run the nation as a totalitarian police state, and they continue to model it after the Soviet Union. Cubans are the only people in the Western Hemisphere who haven’t been able to elect a leader in more than 55 years. When Russia and Venezuela, the main sponsors of the Castro regime, started suffering in the last few months due to falling oil prices, it looked as if the Castro government could finally collapse. That could have paved the way for democracy to finally prevail for Cubans. What the Castro brothers needed in order to survive was an economic lifeline from their enemy, the United States. And that is exactly what the pope and President Obama delivered. The deal also gave their criminal government international legitimacy. Anybody familiar with the Castro regime’s track record knows that legitimizing and propping it up is not in the interest of the people of Cuba! The deal is based on hopes of some American leaders that the Cuban government will reform, but they required no change from it. And it is extremely rare for dictators to voluntarily loosen their power. This is a bad deal for the Cubans. Was it good for the people of the United States? Under the Castro regime, Cuba has acted as one of the Western Hemisphere’s major sponsors of terrorism and drug trafficking. Legitimizing it is a victory for those who want to see America fall. Giving in to that Communist regime emboldens America’s enemies. It is also important that, as part of the deal, Cuba released Alan Gross, an American citizen wrongfully imprisoned for five years, and the U.S. released three Cuban spies. To U.S. enemies, this sends a clear message: A surefire way to win policy concessions from Washington, or to rescue your friends captured by the U.S., is to take American citizens hostage and hold them as long as necessary. This places America’s weakness on display for the world to see. It also potentially endangers Americans by putting a price on their heads. For America, this was a disgraceful surrender. The president undid a strategy that the nation had been using for 53 years, a strategy that might have been on the verge of toppling one of the world’s most renowned criminal regimes. Many American leaders like Rubio didn’t like that Cuban deal, but the pope was not fazed by that. Modern leaders would—and should—object to this kind of deal even more forcefully if they knew anything about the Holy Roman Empire. For many, the fact that the pope endorsed this deal made it more palatable! This shows that they really don’t understand anything about that Vatican-guided empire. It looks so righteous, so good. But look at the history of the Catholic Church! Not only has it authored a lot of foreign-policy nightmares throughout the ages, but conservative estimates say it has presided over the deaths of more than 50 million people! Why do so many just forget all about that? Pope Francis is from Argentina, but we shouldn’t forget that the Vatican got involved in this deal as early as March 2012, when the church was led by Pope Benedict. He is the German pope emeritus, and he has friends in high places in Germany. We need to watch this carefully, because Bible prophecy shows clearly that America, Britain and the Jewish nation are in grave danger and will be double-crossed by a reconstituted German-led Holy Roman Empire. How will this happen? I think Cuba could be a significant part of the strategy. Nobody would suspect the pope of doing anything malicious or double-crossing us or anything like that, but if you look at what the Bible says about the organization he leads, you see that it is not what it appears to be. Study the history of every single time the Roman church started guiding European politics. You see a lot of blood spilled every time! 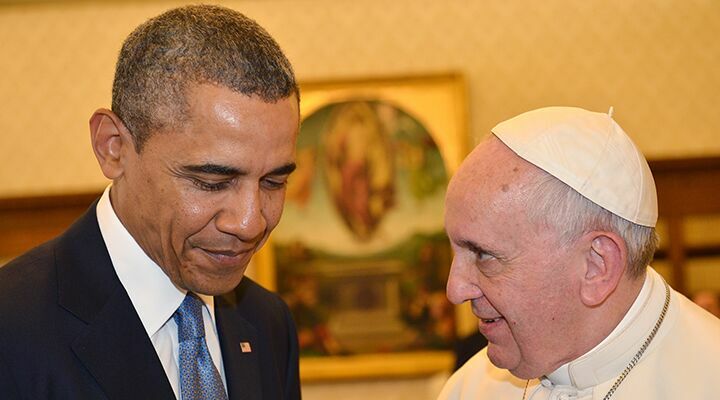 Look at the two men who were the main players of this deal: the pope, and the U.S. president. If you read our two booklets Germany and the Holy Roman Empire and America Under Attack, you will see that these two do not have the good of America in mind. Quite the opposite! And if they are working something out behind the scenes, like this Cuba thaw, then you have to believe there may be something really big going on. Which nation is the model of free-market global capitalism? The United States of America. If Pope Francis is to be taken at his word, he could not possibly wish for the capitalist example nation to thrive, prosper and continue inflicting its “tyranny” on the world. If he is sincere in saying the capitalist system is a force of destruction, then he would feel not only justified, but obligated to use his influence to weaken it. And if decreasing U.S. power is among Francis’s goals, he may have discovered that the current U.S. administration shares in it—to varying degrees on various policy points. Bible prophecy discusses a massive double cross that the German-led European Union will commit against America. That double cross very well could include cyberattacks. It could knock out huge parts of our power grid and cause serious mayhem. That prophecy says those European nations are America’s “lovers” right now, but that will not be the case for long! That “massive listening post,” so close to the U.S., could make the cyberwar far more dangerous! When you consider what the Vatican is doing, you see how the Holy Roman Empire could also get control of that espionage facility. Hackers recently attacked the U.S. Central Command Twitter page. This prompted Ron Fournier of the National Journal to say, “We can be brought to our knees over the Internet”! Ezekiel 7:14 is an end-time prophecy indicating that will happen! Can you imagine America, the great superpower, being attacked, and not even responding? The German-led European Union is the seventh and final resurrection of the Holy Roman Empire—that same Holy Roman Empire which, centuries ago, used Cuba so powerfully to fuel its wars. If the present resurrection were to move into Cuba again, it would be well positioned to make these kinds of attacks happen. The advantage is that it could do it in the cloak of secrecy, since Cuba is essentially a police state with tight controls on information. Think of the control that it could have. Think of how valuable Cuba has been to America’s enemies in the past! You need to watch what is happening in Cuba. The Bible shows that this will all happen quickly. And we are getting so close to this time! The seventh resurrection of the Holy Roman Empire is apt to burst on the world scene in 2015 or 2016. It will have similar ambitions to what Charles v and the fourth resurrection had, and all its other resurrections. And that includes the sixth one under the political rule of Adolf Hitler! The seventh head will cause many problems in this world. But it also ushers in the best news this world has ever heard! That empire is going to fight Jesus Christ when He returns. Christ will destroy the Holy Roman Empire and usher in world peace, prosperity and joy forever. Many Bible prophecies tell us of this wonderful event!